Center City Design Work… South Jersey Prices! Market3Design is a South Jersey based web design firm specializing in the creating beautiful, customized websites built on the WordPress platform for companies all around Philly. We’re right across the bridge, a short 13 miles outside Philadelphia. Don’t pay city prices just so your designer can boast about a Center City office. We offer award winning design at a fraction of the price – take a look for yourself! Besides – we’ll come to you! Give us a call and we’ll head across the Ben Franklin and have an old-fashioned sit-down. Click below to see more of our award-winning web design work! Click For Our Entire PortfolioWe have designs for every style! We are a WordPress power house. (We know, it’s not nice to brag, but it’s true.) What ever you can imagine, we can build it on the most powerful, easiest to use web platform in the world. There’s a reason 25% of the world’s top websites are built with it. Let us put it to work for you! More than half of all internet traffic is on a mobile device. If your site isn’t mobile friendly (aka responsive) you’re loosing business. Period. If you like the site you have, we can make it mobile friendly without changing the look or feel, and you save money on design costs. Take a look and see what we’re all about. 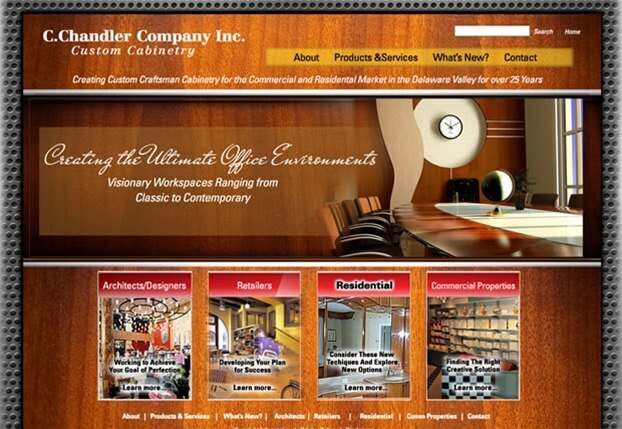 Our website portfolio shows examples of websites from around New Jersey, Philadelphia and New York. Our websites come in every style, color and concept our clients can imagine. You dream it up and we’ll make it happen. Most web companies just focus on how pretty your site is. Not Manna. Our first focus for an eCommerce site is making you money. It’s that simple. Sure, they have to be attractive, but also fast and easy to use. They must draw the visitor in and push the sale. Isn’t that what its all about? While many web design companies can build a website in WordPress, at Manna, we specialize in it. In fact, WordPress is the only platform we build new sites on. We use it because it is the overall best platform for empowering you to maintain your own website. Hackers spend a lot of time trying to break into websites. If you don’t keep your WordPress site up to date with the latest versions and security measures you make their job much easier. Our team members are specially trained to keep your site secure and safe. WordPress uses CMS. CMS stands for Content Management System and is designed for the average person to make changes to their website as often as needed, reducing additional maintenance costs. By taking the time to learn how to use CMS software, our clients can save money in the long-term on web updates. You’ve invested a lot of time and money into your website and it represents your organization 24/7/365. This makes it far too important to not maintain it or keep updated with fresh content. We understand the importance of this and offer several options to help you get the most out of your website. Keeping your website safe and secure is one of our top priorities. Manna has preventative maintenance plans and WordPress security packages to ensure your website is protected. If your site falls victim to an attack, we have the ability to clean and restore compromised websites. At Manna, we offer professional web hosting. Our service plans are designed to fit every need, whether that be full service or self-managed. Our hosting is among the most reliable in the business with a guaranteed 99.9% web server uptime and 24/7 on-site network engineers. Manna offers multiple different plans and packages, as well as hourly rates, to fit your website maintenance needs. In addition, we have a 24/7 Emergency Support system for when something goes wrong. Same day website maintenance is guaranteed to all clients, even new.